As Rip Hunter recalls moving to the end of time with his father Booster Gold during an attack, the Time Masters are falling through a time vortex. Hal Jordan eventually uses his Green Lantern power ring to help them return to Serhattu's castle, where a mystic pool shows various ages. Rip sends Claw and Starfire to their points of origin. Hunter then sees the image of the Manhattan Project in 1945. Serhattu and the sorceress Skyle want to steal the experiment's first atomic bomb for its awesome power. Rip has planted explosives to prevent the evil wizard from ever traveling to the past or future if he returns. Now, the Time Masters must stop Serhattu's vicious plot from coming into fruition. Otherwise, space and time could be in grave danger. Supernova is following the Black Beetle and Linear Men Matthew Ryder and Liri Lee as they search for Waverider's body. They find it, but Matthew and Liri are suspicious of their liberator's true intentions. The Black Beetle could use the Linear Men's fallen ally's power to destroy the very fabric of time itself. Superman has prevented Serhattu and Skyle from stealing the Manhattan Project's atomic bomb while Green Lantern uses his ring to protect everyone from the explosion's lethal radiation. Rip Hunter has sent the wizards back to Serhattu's castle, where they find all their time portals utterly obliterated. Now, the Time Masters can resume their search for Bruce Wayne. Only one thing stands in their way - Professor Zoom, the Reverse-Flash. He will stop at nothing to prevent them from completing their mission. All hope seems lost in finding Batman now. Story - 2: There's more to enjoy with the Linear Men, Waverider and Professor Zoom. Unfortunately, DC has placed these elements in the middle of an event (The Return of Bruce Wayne) that is, quite frankly, over-hyped and not as interesting as it should be. 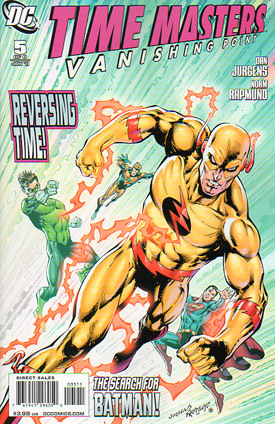 Dan Jurgens could have easily written the return Linear Men and Waverider as a stand-alone event. The whole search for Batman feels like an unnecessary publicity stunt that has failed miserably. Okay, Serhattu and Skyle apparently have magical based powers. Why the heck do they need to steal the first atomic bomb? It's a huge plot hole that merely feels like an excuse to drag the mini-series out more with unnecessary filler material. Jurgens has gotten rid of the unnecessary baggage of Claw and Starfire, and the story seems to finally be moving a little better after the sluggish pace of the previous issues. However, it still feels like a two issue arc is being crammed into a six book series. I'll stick around until the end. I just don't have high hopes for the conclusion. Art - 4: Jurgens' Superman looks great as usual, but the rest of the art merely tells the story. Nothing stands out in my mind. Cover Art - 5: This is perhaps the best cover in the series. I wish more were like it.